Offering support: Casino parish priest Fr Peter Slack with students at St Mary’s Catholic College. 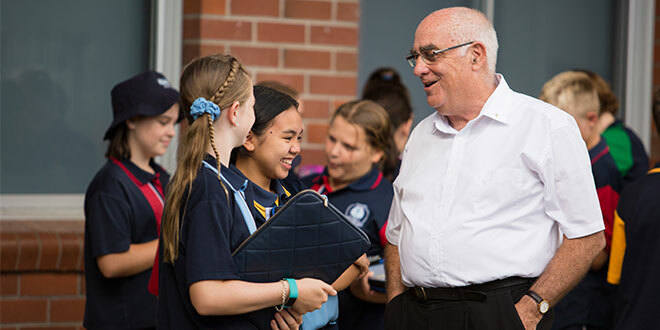 ST Mary’s Catholic College, Casino, has launched the Mercy Scholarships Program offering fee concessions for Year 7 students. Principal Aaron Beach said the scholarships would be offered based on students’ academic achievement, effort and accomplishments in sport or culture. “For the first time in its in ninety-nine year history, the college is excited to offer these Mercy Scholarships for two Year 7 students, which will follow them through their years at the college,” Mr Beach said. Students will need to meet eligibility requirements and the scholarships are open to students who will be starting Year 7 next year. “The scholarship program is part of our focus on outreach to the community of Casino and the Richmond Valley,” Mr Beach said. “We want to enable students who would be eligible to come to our college but, due to financial impediments, wouldn’t otherwise have the opportunity. St Mary’s has a proud history and Mercy traditions, for which the scholarship program has been deliberately named. Students are actively encouraged to live out the college’s motto to “Reach Out”, through various social justice and service programs in the community. St Mary’s offers counselling services; programs for students with additional learning needs, including literacy and numeracy workshops; and programs for gifted and talented students. The college also offers a homework centre where students have the opportunity to work on their class assignments in a supervised environment, after school. “We are proud of our HSC success, achieving some of the most commendable results in the region with many students fulfilling their goal to attend university,” Mr Beach said. St Mary’s EARTH Centre provides students with a working agricultural farm and a “real world” automotive workshop that gives students an authentic study and work environment. “We want to offer as many opportunities for our students as possible including both trade and academic pathways,” Mr Beach said. St Mary’s is holding its annual open night on May 7 from 5.30pm.